In episode 64 Kelly Surtees and Austin Coppock join the show to talk about the meanings of the seven classical celestial bodies, as well as how astrologers developed those meanings. The topic was motivated by Chris recently finishing a translation of a chapter on the significations of the planets from the 2nd century astrologer Vettius Valens, and wanting to discuss how astrologers conceptualized the planets when there were just seven. 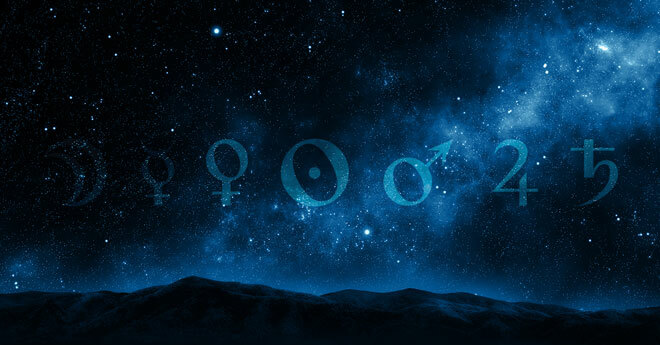 Part of the purpose of this episode is to help astrologers become more familiar with the meanings of the visible planets, and how their meanings function as an interrelated group. Below you will find an outline of some of the topics covered during the course of the episode, followed by links to stream or download the recording. The set up is that I’ve been working on this chapter of my book on the planets over the past month, and wanted to talk about it. Finalized a translation of Valens 1, 1 on the natures of the planets. Important for astrologers to get a good grasp of the 7 traditional planets on their own, and not be overly dependent on the outer planets, like a crutch. Where do the significations come from? How would one generate them from scratch? While mythology is relevant, it is not as important or resorted to as frequently in the early tradition as one might expect. Only in modern times that this becomes the primary go-to for meanings. Raises some issues or questions about new planet discoveries, and whether some of the meanings aren’t being generated on a partially mistaken premise. Most fundamental distinction is benefic / malefic. Tied into observational fact that Venus & Jupiter are bright / Mars & Saturn dark. Allows for contrasts between polar opposites. Moral opposites. Subjective opposites. Contrariety becomes a core concept more broadly. In order for something to signify something, then something must signify the opposite or alternative. Ptolemy’s basic natures and temperaments. Modifications due to planetary condition. Difficulty of articulating an archetype. Discussion of some of the main significations of the seven classical planets, starting with the Moon and then moving up to Saturn. Thanks for the book list. Using traditional ruler-ship has really opened up the chart for me. I know your program ran an hour over intended but it left me wanting to know more about the expression of planets in their dual signs of ruler-ship. I understand the mechanics, why it came about, but not the finer interpretive distinctions. I have surmised on my own, but what did the ancients say? The next podcast? Also really like the idea of experiencing the planets in a visual way. Will have to save that for another episode at some point maybe. I know that it is something that all three of us teach in our courses, but we’ll have to see if we can deal with it at some point in the future on the podcast. Loved your points about opposites and visual symbolism. I’ve been thinking about that a lot lately. I’ve been tossing around this idea about Uranus and Saturn– and it’s why, though I feel the traditional rulers are so informative and telling that I want to start using them more primarily, I’m reluctant to give up modern rulerships completely: If Capricorn is the established tradition, and Aquarius is innovation and rebellion, the visual parallel between Saturn associated with Capricorn, and Uranus associated with Aquarius is kind of… really on point. Saturn is this orangey beige, and Uranus is blue, the opposite colour. Uranus is also the other planet with prominent rings, but it’s been turned on its side. In that way it’s odd and unconventional, maybe even rebellious, and Saturn has rings but it’s otherwise a pretty normal planet. Uranus was the first outer planet discovered, and in a way “broke” the boundary of Saturn (and is found outside of that boundary). And it was all because of technology and innovation! I don’t doubt Saturn’s ties to Aquarius though at all–Saturn transits BRING change when something isn’t working, and “the upheaval of revolution” isn’t a bad way to describe my experience with them–but that contrast between those two planets really fascinates me! I have to wonder if the simple fact that we HAVE discovered the outer planets and have associated them with certain signs didn’t simply happen precisely TO give us new insight into some of these archetypes, though I couldn’t begin to say what, specifically, those insights are. But all the aggressive rejection of outer planet rulerships or any sort of convention in modern astrology (not here, I appreciate the open and thoughtful discussion here, but elsewhere) is off-putting when there are so many questions to be asking instead! I love the idea of wisdom through hardship (emphasis on the idea of it– it’s never fun in the moment). Saturn’s definitely a teacher. I’m certainly not lacking in Jupiterian optimism or the tendency to explore and ask big, expansive questions about life and faith and meaning, but I’ve grown so much from the hard lessons, too. And honestly, they complement each other so well– finding the meaning and hope (Jupiter) in tough, practical, grounded lessons (Saturn), and then being able to tie it back into a bigger picture (cohesion). I think through looking at the traditional rulerships and their relationships to the signs you can reach a better understanding of the signs too, as well as the planets. What does Pisces share in common with Sagittarius? Faith, for one. But additionally, they’re both broad-minded and expansive, they lose the details for a larger picture. For Sagittarius that’s faith through learning. In contrast to Gemini’s detail-oriented (though scattered), more empirical way of learning, Sagittarius is big, wide, philosophical. Pisces is faith through compassion–through sheer intuitive empathy and the understanding that none of us are separate, and grand gestures like sacrifice are associated with it. Mercury’s Virgo shows compassion through practical, detail-oriented service, offering what they, as one humble person, have to give here on /this/ plane of existence. I dunno, I like learning through contrast, apparently! Just some stray thoughts– I love these podcasts, there’s so much to chew on! My favorite show so far. I like this idea of starting from scratch to understand the roots of astrology. I often use keywords or concepts without knowing why, and even it works, I feel something is missing.